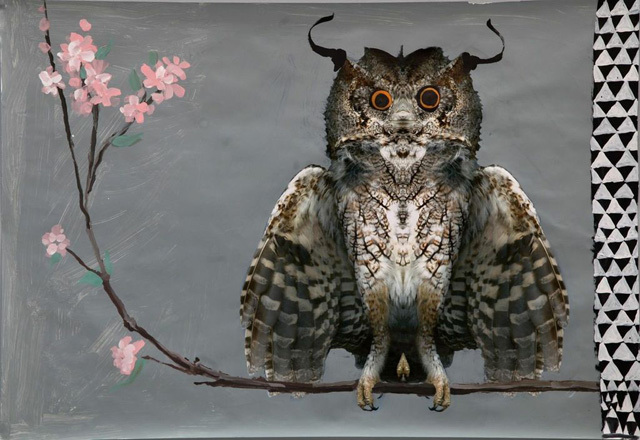 Image: Owl, 2014, Mixed-media on paper, 106 x 155 cm. Cooperative Work Rokni Haerizadeh, Ramin Haerizadeh and Hesam Rahmanian. Courtesy the artist and Gallery Isabelle van den Eynde, Dubai. In their current collaborative show – The Exquisite Corpse Shall Drink the New Wine, Rokni & Ramin Haerizadeh and Hesam Rahmanian transform the “white cube” gallery space of Gallery Isabelle van den Eynde, located in the industrial neighborhood of Dubai, into a “theatre.” Showing multi-faceted work ranging from collage and painting to mixed media on paper, they superpose images and materials on top of each other in a satirical and playful, sometimes fantastical way. The Haerizadeh brothers and Rahmanian have created (or curated) “rooms” in the usually spacious gallery, engaging the viewers in an unexpected visual and spatial experience and turning our established ideas and beliefs on contemporary society and art world up side down. Their references to a myriad of cultural, literary and artistic sources add to our multilayered experience. While medium is not the major drive for the trio’s diverse creative process, the artists are motivated to blur the boundaries between the personal and professional as they live and work together in their home/studio. 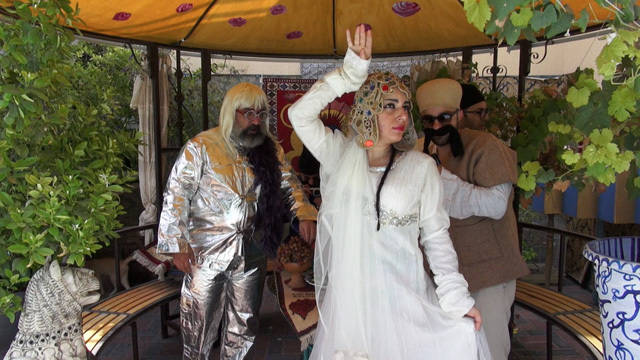 They not only work with other artists, actors and friends, such as Iman Raad, but also collaborate with non-artists, including their housekeeper, the gallery’s driver and a random person they met in a parking lot. Thus spontaneous social interactions lead to spontaneous art-making. Having revisited the show several times, I decided to discuss how the artists worked towards this provocative yet humorous show, their recent US residency and what it means to be co-habitants and co-exhibitors. A selection of Bach and Purcell playing in conjunction the show accompanied our much candid interview. Rokni & Ramin Haerizadeh and Hesam Rahmanian, The Exquisite Corpse Shall Drink the New Wine, 2014. 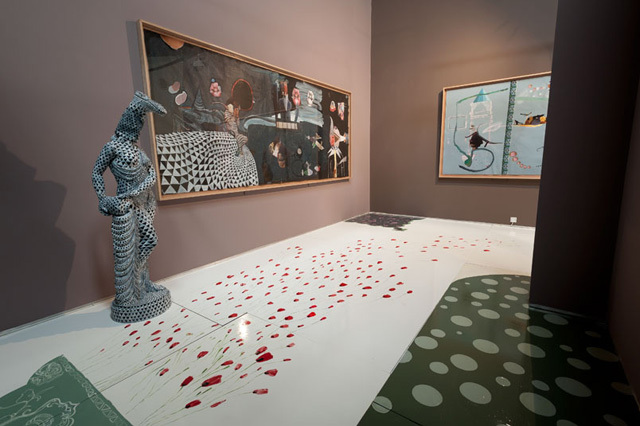 Installation view, Gallery Isabelle van den Eynde, Dubai. İpek Ulusoy Akgül: I would like to start by asking you about the visitor path in the show. Entering The Exquisite Corpse Shall Drink the New Wine, we are greeted by Mike Kelley’s Little Friends and immediately immersed in an ambience, a theatre-like or museum-like setting. 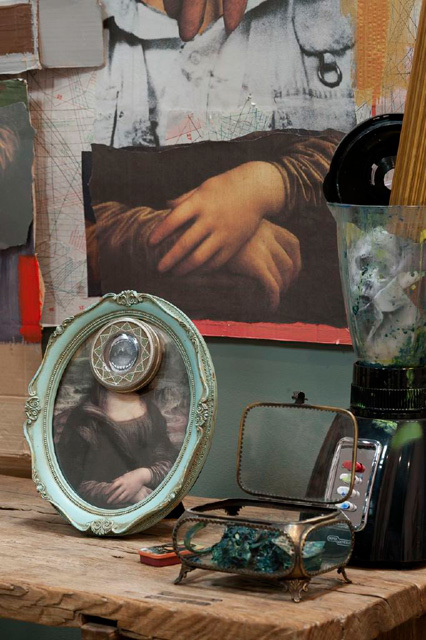 You have beautifully curated these objects and found images. One may notice that you consciously disregard some hierarchies and blur the boundaries between individual works. In this respect, do you expect the viewers to follow any specific paths in between the “rooms” or do you invite them to take in the whole thing as an experience? Rokni & Ramin Haerizadeh and Hesam Rahmanian, The Exquisite Corpse Shall Drink the New Wine, 2014. 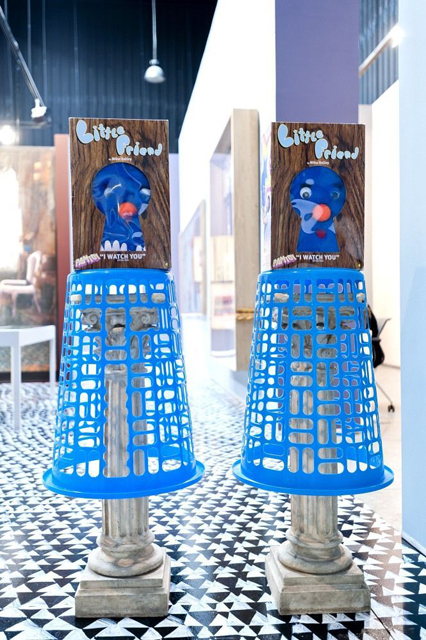 Installation view with Mike Kelley’s Little Friends at Gallery Isabelle van den Eynde, Dubai. Rokni Haerizadeh/Ramin Haerizadeh/Hesam Rahmanian: The latter. RoH: Also, the base was that it’s a theatre. The audience is part of a theatre. So, we were emphasizing on the comedy to describe it like a presence of equality. So that’s the main thing that we built our space on – to describe the comedy. İUA: So definitely we, as viewers, are part of it. RoH: That’s also why you’re walking on art. We were sensitive to changing the floor. It’s kind of a semi-painting. You don’t have that trust on the floor; you get suspended. İUA: You also create some sort of tension in viewers by doing that. RoH: You walk on painting. İUA: You turn our values up side down in this show, not only on contemporary society but also the art world. RoH: Exactly. That’s why we are in this situation, because we live together. We have some topics. In the mornings, we start to argue with each other talking about these kinds of problems. HR: Sometimes arguing but not all the time. It’s more of a discussion. İUA: Could you tell us more about your daily routine? HR: I think it’s discipline that we started forming five years ago. We all got together in Dubai. So this kind of routine and discipline – it was not there. They obviously add up and come together. For instance, we all wake up early in the morning. HR: Like 4.30, 5 in the morning. I go for a walk with the dog. And Ramin and Rokni go to the gym. And then we almost are ready at some point to sit behind the table in our living room to have coffee together, to discuss the movie we watched last night, to discuss the discussions we had the night before. RoH: We read an article or discuss a topic in the daily newspapers. Books or our future program can also be the topic of the day. HR: After an hour or two, depending on our discussion, we go to our own studios, start working on certain things that we are doing. Either it’s related to collaborative work or individual works. We are all in the corner of the house, somewhere in the house working till lunchtime. Then we order food, have lunch, and then we take a short nap. Start again and go on till 7. RoH: We then watch a movie. From different parts of the world. Independent movies usually. These make our topic for the next day. The idea came from Michel Foucault’s Discipline and Punishment. How the system describe your soul. So actually the soul is a prison of your body. Not like Sufism – they think body is the prison of the soul. Foucault argues some thing different. After a while people take it as immanent. İUA: Power becomes inherent almost. RoH: This is what we’ve been practicing for the past five years. İUA: You’ve moved to Dubai around the same time I guess. RoH: As soon as we were little bit settled down, we asked Hesam to join us. We were childhood friends. He’s part of the gang. So we started this kind of thing. İUA: This is a multi-layered show with many cultural, personal and artistic references. You are looking at literature, poetry, and pop culture. RoH: Yes. In this region, we have this thing – the main thing came from the West; we imitate the West. We lost some references; we add these to our references. We become multiple. When I see art from the region, you could not see that it’s one thing. Of course you have different references. Before when we were in Iran, we’d think ‘We have that!’ but of course when you travel to Turkey, for example, you have that as well. İUA: So you observe similar experiences as you travel. RoH: We share the same thing. We have the corrupted governments, etc. Because we are in the middle; we are creatures; we are not accurately modern. İUA: Going back to your references, could you say a few words on the title of the exhibition? I believe it’s in reference to the Surrealist movement. Could you elaborate more on that? RoH: It came from André Breton. We took it as a technique. In our work, it’s like a technique. It’s like a pencil or oil color. Instead of “representing” we’re looking at the present. That’s why we don’t call our collaboration anything. We don’t put a name for our collaboration. We don’t believe in that. We’re looking for and striving to find a way to show the presence of the collective. We accumulate our idea. Everybody put the idea together. Sometimes they’re not an idea they are a banal act or ordinary way of being. We use all of them together. We also embrace the banality. İUA: You also don’t draw boundaries between your professional life and your personal life. It makes sense in that way as well. RoH: The concept of “white cube”, for example, pushes you. I as a human, man, human being, I drink this and wear this and do the drawing on a table. Suddenly it is an exhibition. This thing goes with the passepartout and it becomes an object. It’s far away from these moments that we have. We’re questioning that thing, that fetish thing on the wall. We’re not used to that. That’s why you have the collectors. Part of our practice is that we started to change our role you know to become a collector. And we have a collection. İUA: How long have you been collecting? RoH: Ten years in Tehran. Ten drawings, lithographs, we started like that. İUA: And, when did you begin to show those “visual quotes”, as you describe them, along with your work, in other words, integrate them in your own exhibitions? RoH: We had come out of the country; we didn’t want to go back and then we had a warehouse where everything was messy. There was an exhibition in France. You enter into this place. White wall. One work. The work belongs to the messy, dusty place. RaH: When it goes to Paris on that white wall, people come and ask you the question that is about that work. But during that work so many things happened. There is an intensity, multiplicity inside. İUA: You talk about the work’s de-contextualization from its memory or its life. RoH: Yes. It’s like grabbing a tiger or a giraffe and putting it in a living room. RoH: These questions have risen five years ago, before we came here. The environment is thus very important for us. HR: All of us we work in different media, with anything we find really. The medium does not really matter. Even when we move in the living room or anything we change at the house, it’s part of the life that we’re living, part of our everyday discipline. So that becomes a work. Like one of us moves a frame from the wall and everything in the house is changed in the house based on that one thing. When all of us is involved in that, somehow that is work. There is no media to describe that. İUA: Could you tell us more about how you work with found objects? Hr: My works are sort of ready-made. I am making this cycle of life that is happening in our house. To every object I find in the house I give it life again. A lot of the objects are actually coming from Rokni and Ramin. They are not specially mine. I don’t really go to buy them to make them. They are really thrown-away objects. 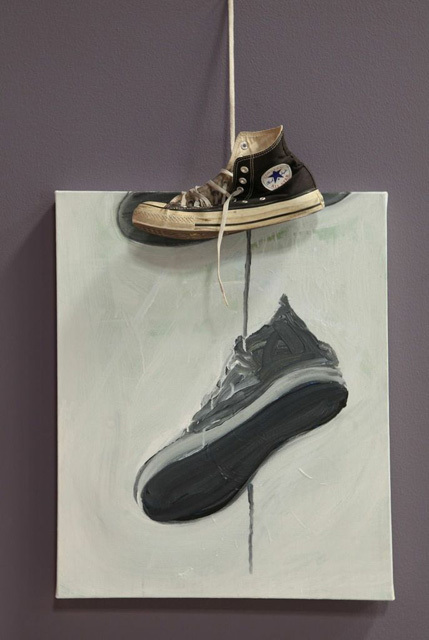 Hesam Rahmanian, Converse, 2013. Shoe and collage on canvas. İUA: How do you select among these objects? HR: We have a lot of carton boxes, soda cans, empty bottles – so many things we have or we find. I try to make assemblages with those, and they somehow feed each other. The next step for me is to stop painting, when I do painting I have a left over of my acrylics on my palettes and why I do with that acrylic is to take them of the palettes and I do collage with them and so they are all kind of this ecosystem. I try to create this ecosystem inside the house. Sometimes I decide what I am making; sometimes it just happens. It very much depends on the material that comes to my hand. And a lot of times I have to search for something that I really need having in mind what I need to make. RoH: You as an artist are not making the coffee cup I am holding now. You give it to me and I make it for you. It’s a matter of ownership. That’s why we collect as well. It’s a work that belongs to that part of our life. To blur ownership, to play around with it is something we often do. Sometimes Ramin gives me an idea, I paint it. I paint Ramin’s idea. HR: And at the end, Rokni’s signature goes at the bottom of it. So the question is: ‘Is it really his work or is it Ramin’s work?’ because Rave gave the idea and Rokni depicted it. İUA: I think the painting Holly Sh…t! also has a similar story in terms of ownership, right? HR: It’s funny because this work looks kind of damaged because I did the painting some time back. It was probably 2012. I took off the stretcher, rolled it and I threw it somewhere. And Ramin found it, so we are actually considering this as Ramin’s found object. Hesam Rahmanian, Holy Sh..t!, 2012. Acrylic and spray-paint on paper, 44 x 59 cm. RoH: So to blur the boundaries of ownership as well as the idea of ‘a gallerist’ and ‘white cube’ is something we do. For example, when we started this show, nobody knew what we’d do. I think it’s a good sign for us to play around like this. İUA: You’ve been working with Gallery Isabelle van den Eynde for a while now, maybe it’s a good moment to discuss your show I Put It There You Name It there from two years ago. There are obviously many threads between that and your current exhibition. You had also transformed a booth at Art Berlin Contemporary. These three things are well-connected. İUA: So, where does the Rauschenberg Residency you recently did fit in this continuity? Residencies are usually considered to support creative experimentation and engagement/exploration with new materials and techniques in addition to artists’ normal practice. Did this residency allow you to work in a way different than your usual routine? HR: Everybody told us it’s such an amazing place because of its location. We were thinking “How are we going to work? What are we going to do?” At the end, we just decided to go with the poem. RoH: Yes. We started to think about that one and go freely. We suddenly ended up at the Robert Rauschenberg studio – this huge white, infinite white space. İUA: Could you tell us more about the space? HR: It was untouched. Rauschenberg lived there for forty years but did not change his surrounding or the nature he was living in much. You’d go and see everybody had their own landscapes and their gardens, but he actually kept his place. You’d still feel that you were in a jungle. It was completely untouched. The hurricane in 2004 hit Captiva and actually demolished the whole land. And he was very sad. They were building again and bringing up the land. The whole space, the ambience, nature was amazing. Days of Captiva, 2014, Mixed-media on paper 155 x 375 cm. Cooperative work Rokni Haerizadeh, Ramin Haerizadeh and Hesam Rahmanian. RaH: The only experience we brought with us was our discipline. And the poem. HR: Every morning we’d wake up at 4 o’clock. We had this routine; for seven days we had seven colors. So we’d wear that color of the day and go to the fishing house of Robert Rauschenberg. And we’d start to improvise, very spontaneously start performing and interact with the place. That seven days repeated for two weeks. We’d wake up at 4 o’clock. By sunrise we’d go to the house and then freshen up go to the studio, the main studio, and start working there. The two weeks was about the poetry. İUA: How did you come across to this poem? Did you know it from before? RaH: He’s a famous figure in the Persian literature, from modern era. He destroyed the classical poetry that continued for 800 years – he was a very famous figure for that. We never had good translation for any poem. Nobody paid attention to the translation. When you translate poetry, the translator has to tell the poem again, not really translate it. İUA: I feel that the content is so relevant within the contemporary context as well. 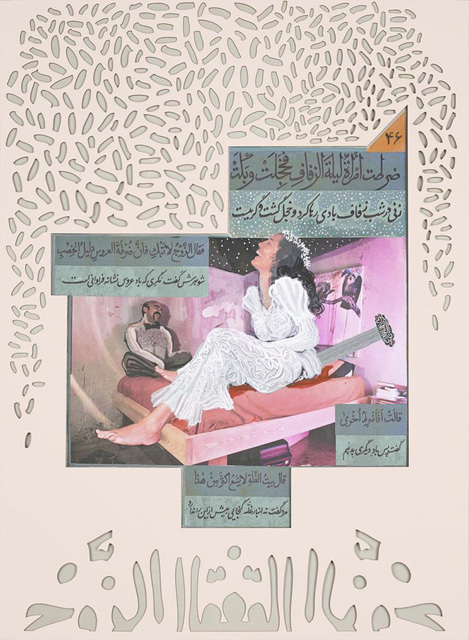 İUA: To continue on poetry, maybe you can also talk a bit about your continued collaboration with Iman Raad in Joyous Treatise, which was also shown at the miart fair in March? HR: Joyous Treatise (or Risala – i – Dilqusha) in this show is the four of us. And it’s an on going project. It started in 2011 was we started doing performances. These are stories that are coming from Ubayd-i Zakani, who is a Persian poet and satirist. So we did performances based on each story. So Rokni and Ramin – they were doing the painting, collages and the calligraphy. And then when that was finished, I started doing the borders. Then it would go from my hand to Rokni’s hand and Ramin’s hand. Ramin would do some collages, and then Rokni would do some painting, and Iman would do part of the calligraphy. It would circulate among us. Even after I did the borders, it would go back to them again. They are all satirical works from 14th century, the same time that the stories were written at the same time both in Farsi and Arabic. So it was never translated; they were original texts in Farsi and Arabic. That was one of the reasons we did it. 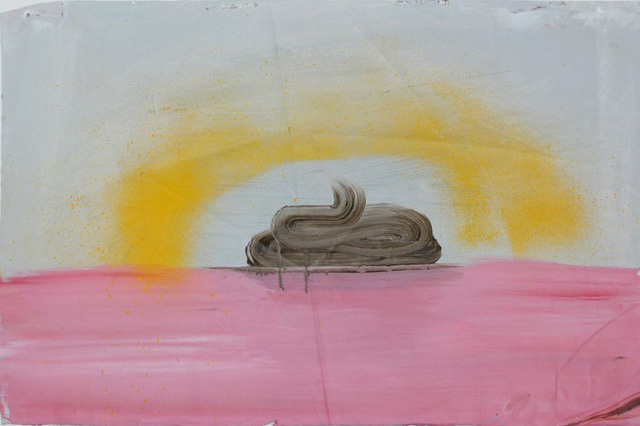 Joyous Treatise, 2011–2014, Mixed-media on paper 76 x 56 cm. Cooperative work Rokni Haerizadeh, Ramin Haerizadeh, Hesam Rahmanian and Iman Raad. RoH: Zakani is the father of satire. İUA: Joyous Treatise and the video Chay-e-IRAN facing it speak so well with each other. HR: Iman also took part in Chay-e-IRAN. He’s one of the characters. Chay-e-IRAN, 2013, Video 37 mins (approx.) Cooperative work Rokni Haerizadeh, Ramin Haerizadeh and Hesam Rahmanian. İUA: There is definitely a strong dialogue between these two as Joyous Treatise have originated from your performances, also depicted in the video. RoH: The translation of delqusha in English is not good. When you read the short story, your mood is changing. You become happier than before. What he wrote in three sentences, it’s timeless. So we started to take a picture to do that performance. The stories are talking with each other. These are like moments. RoH: It’s funny that as human beings we say we are very ‘modern’, this and that, but actually nothing changed. The human is same. Another thing when we read was My Name is Red My Name is Red by Orhan Pamuk. İUA: Speaking of Pamuk, this show reminds us of his Museum of Innocence – the novel and museum – as well. RoH: We haven’t had a chance to go there yet but received a similar comment before. İUA: In terms of the concept of obsessively collecting and bringing together many images and objects. It is a multi-layered show. Going back to the residency, could we maybe discuss the video O, You People along with other Captiva works? HR: In the video, you can tell what day of the week it is by the color of the coats we wear. And that also comes from the story. From an old Persian love story from, I think, 6th century by Nizami Ganjavi. Everyday we picked a color. For instance, Sunday relates to sun, so it’s yellow. Saturday relates to Saturn, so it’s black and so on. We were wearing those colors everyday. İUA: Color seem to be an important element in your work and especially in its presentation. The color of each ‘room,’ created by temporary walls in the usually roomy gallery space, for example, creates the mood of the space in your current show. You are strongly attached to colors. RoH: Also in the house, we are like that. They are like objects. We are looking at it as an object. It makes you feel something, interact. The background is important. I think it came from our school in Iran. They were so religious. It was a religious school. They would paint the wall and write a slogan like ‘If you tell lies you are going to burn in hell.’ It was always in the background. That kind of slogan. We’ve grown up with this. Our school was like a prison. İUA: It’s interesting that you make a connection you between school and prison. It brings us back to Foucault again. RoH: These are the things we think about regularly. İUA: Earlier we discussed your collaboration with Raad; you collaborate with other artists, actors and dancers. But if I am not mistaken you also interact with non-artists and do exchange ideas that lead to new work. RoH: There is a piece in the show titled Owl. We collaborate with everybody. In Captiva, we made a work on a dead owl that the studio assistant at the residency found. He brought it to us; we then scanned it. You’d never know if he’s happy, excited or sad but we saw the joy in his eyes when we scanned and made this work. We can make an artwork out of such a thing. They are like poetry, these kinds of works. Suddenly they come without any purpose. There is no intention to make that work – I’m thinking about owl and lets make a work about an owl. It wasn’t like that. They were just interactive. Owl, 2014, Mixed-media on paper, 106 x 155 cm. Cooperative work Rokni Haerizadeh, Ramin Haerizadeh and Hesam Rahmanian. İUA: Having revisited the show multiple times, I still have many questions but maybe we can end by Royal Goldfish and how you created this fantastical work based on the royal family photograph on the occasion of christening of Prince George? RoH: I am sensitive about these types of images in my individual practice. You are consuming them. They are invading your house … It’s not the Royal family, these are not important. These are not my aim. I don’t want to criticize something; it’s not like that. It’s based on image that invades you and get repeated and come into your whole system and become part of you. These are not part of our lives but we are part of it somehow. Many questions started from that moment. It’s representative of the system somehow. 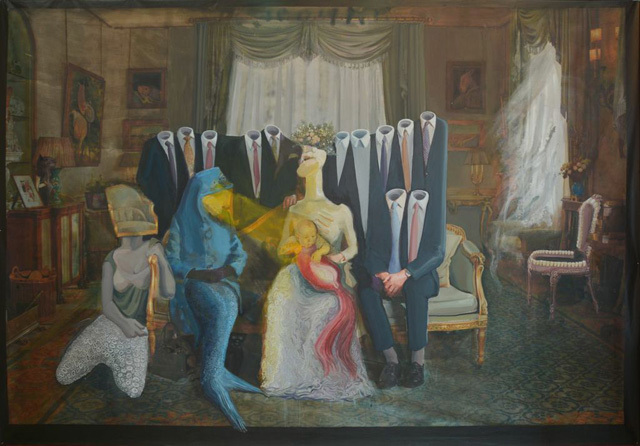 Rokni Haerizadeh, Royal Goldfish, 2014. Gesso, ink and watercolor on canvas, 300 x 435 cm. İUA: Some images definitely become part of your life even if you are not really interested in seeing them or the story behind them. You often work with existing images from media all throughout the Fictionville series. RoH: These are all continuing work. They shape each other. In the first three years, I was interested in physical violence; we are consuming those images everyday. For Royal Goldfish, I looked at music, dance etc. It was like a research for me. Goya, Rolandson, all the printmakers in London, the British folklore dance. I also started researching on Crystal Palace and then folklore dance. İUA: I truly appreciate your time for this fruitful conversation. Thank you so much Ramin, Rokni and Hesam. Fetish 4, 2014. Mixed-media on canvas, 403 x 153 cm. Cooperative work Rokni & Ramin Haerizadeh and Hesam Rahmanian. All images Courtesy the artists and Gallery Isabelle van den Eynde, Dubai. The interview took place at Gallery Isabelle van den Eynde on April 24, 2014. The interviewer would like to thank the artists for their generous time along with Barrak Alzaid and Jules McDevitt from Gallery Isabelle van den Eynde for their support. 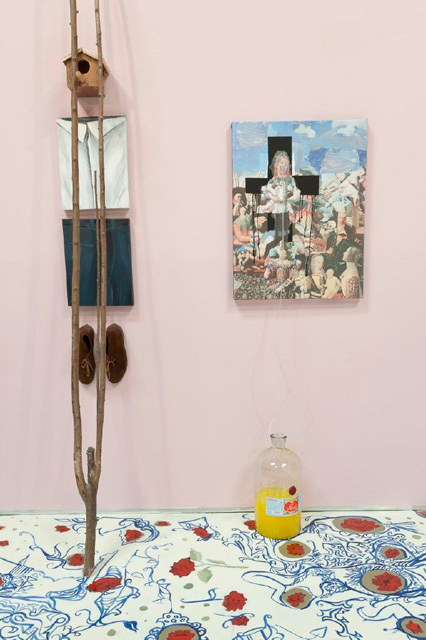 ‘The Exquisite Corpse Shall Drink the New Wine’ continues until May 18, 2014. İpek Ulusoy Akgül recently was Curator-in-Residence at A.i.R Dubai where she worked closely with international and Emirati artists towards an open studio exhibition. She previously served as the curatorial associate at Borusan Contemporary in Istanbul (2012-2013), where she coordinated new media exhibitions and commissions. İpek has worked at various museums and arts organizations such as The Whitney Museum of American Art (2009-2010) and Independent Curators International (ICI) (2010) in New York, as well as the 9th and 10th Istanbul Biennials, Sakıp Sabancı Museum (SSM) (2005-2007), and Galeri Mana (2011-2012) in Istanbul. İpek received her MA in Museum Studies from NYU and BA in Cultural Studies from Sabancı University, Istanbul. Posted in content, on artists and tagged Hesam Rahmanian, Rokni & Ramin Haerizadeh, The Exquisite Corpse Shall Drink the New Wine, İpek Ulusoy Akgül. Bookmark the permalink.